Mowing hills can be both challenging and dangerous at the same time. It is important to find one of the best mowers for hills if you are dealing with this type of terrain in your yard. This is especially true for particularly steep mowing areas. Some lawn mowers are built better than others to handle slopes. Most standard lawn mowers are only able to safely handle slopes up to about 15°. I pulled out one of my manuals for a Craftsman lawn mower I use on flat surfaces and it actually has a page devoted to gauging the angle of a slope. If you are dealing with mowing slopes, it may be time to find the best mower that is able to handle these challenging areas. Below we have provided our picks for the best mowers for hills. We have split up our the picks between riding and walk-behind mowers. This will hopefully make it easier for readers who are specifically looking for one type of mower over the other. 5 year warranty. Limited lifetime warranty on deck. Its MicroCut Twin Blade system is touted as being superior to most other competing 21 inch mowers. The dual blades are able to cut the grass into very fine pieces, which you won’t achieve with other standard blade mowers. The mulch created from the twin blades is able to decompose quicker because of the tiny clippings. The Versamow technology allows the user to select between mulch, discharge, bag, or leaf shred by sliding a lever. The mower even allows the user to partially mulch/bag if desired. Essentially, you have the ability to bag half the grass while you mulch the other half. Why is this mower one of the best for hills? The select drive feature on the handle allows the user to control the speed of the mower. The ability to fine tune your speed on a hill is a nice feature to have when traction is questionable. Additionally, this mower is rear-wheel drive, which provides better traction than the commonly equipped front-wheel drive found on many other mowers. 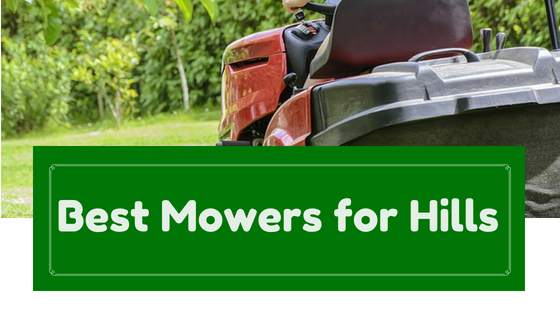 Honda mowers are well-known for their ability to last for years. The 5 year warranty speaks to the quality of this mower. The mower comes equipped with a NeXite polymer deck, which comes with an amazing lifetime warranty. This deck is dent, rust, and corrosion resistant. The GVC 190 cc engine does not require a choke to start the engine and is known for its reliability to start without hassle. The Troy Bilt TB 330 is eqipped with rear-wheel drive for improved traction on hills. It offers six cutting heights from 1.25 inches to 3.75 inches. This is a nice range that will accommodate most desired cutting heights. This is a versatile lawn mower in that it allows the user to either mulch, bag, or side discharge the clippings. The Troy Bilt TB330 comes with a Briggs & Stratton 163cc engine. There is no requirement to prime the engine before mowing. The ReadyStart Choke System allows the user to pull the cord and get to cutting immediately. This mower features a single lever that allows 4 variable speeds. When dealing with mowing hills, you have the ability to adjust your speed to accordingly to make your mowing comfortable instead of relying on a single speed set by the manufacturer. While the Honda featured above is undoubtedly a better mower, this Troy Bilt mower is generally much cheaper but still a quality mower. This Husqvarna mower provides all-wheel drive for excellent traction on various sloped yards. Since all wheels are doing the work, you are given extra balance for those times when the terrain is not ideal. This mower also comes with a Dual Trigger Drive which provide variable speeds up to a 3 mph maximum. This mower comes with four cutting heights from 1 to 4 inches. We would like to see more options for height settings given the higher price point for this mower. However, most user will likely find these settings adequate. Like other mowers with a Briggs & Stratton engine, this mower comes with a 2-pull guarantee for 2 years from the original purchase. Read more about this warranty here. The below video shows an example of a similar Husqvarna mower being operate on a hilly terrain. This should give you an idea of how well this mower operates over sloped conditions. This heavy-duty Husqvara lawn mower is built to withstand rougher terrain. If you are looking for a riding mower to handle hills, this is one of the best. This mower comes with a hydrostatic transmission with locking differential. You can see what a huge difference this makes when navigating hilly terrain (see the below video) when it comes to traction. You will get the comfort and feel of driving a car when operating this lawn mower. As expected with a quality mower, this Husqvarna is able to accommodate attachments such as a bagger or plow. While pricey, this is a very versatile machine that will have no problem handling numerous tasks around the yard. The Poulan Pro 960420182 is a nice choice if you are seeking a riding mower that will perform without being overly expensive. It provide 42 inches of cutting width under a steel deck made from 13-gauge steel. This riding mower may be smaller than others, but it does not struggle with power with its 15.5 HP engine. This model includes a hydrostatic transmission, which is beneficial for homeowners dealing with hills. There is no need to stop to change speed or direction with this transmission. You get a 6 inch turn radius on this mower, which allows the user to easily move the machine around objects scattered around the yard. Finding the best mower for hills can be challenging since not all mowers are ideal for sloped terrain. Below we have outlined some things you may consider when finding a lawn mower for hills. Rear-Wheel or All-Wheel Drive: RWD or AWD will provide the best traction control on hills. There is some debate on whether AWD is even worth the extra costs, particular if your yard is not excessively sloped. Check out this Consumer Reports article which addresses some interesting points on AWD. Unless the slopes you mow are minimal, you will want to avoid front-wheel drive mowers for hills. Speed Control: Less expensive lawn mowers are typically equipped with one speed setting that is set by the manufacturer. Higher-end mowers typically have a speed control that allows the user to adjust the mowers speed to a comfortable setting. Speed control is a nice feature to have when dealing with hills since they are often tricky to navigate. You want a great range of flexibility in speed so you can adjust as needed. Deck Size: The size of the mower deck is something you will want to consider. Yes, a bigger deck size will get the mowing done faster, but you have to ask your self if it is practical for your yard. If you are dealing with tight spaces or lots of obstacles, a large deck lawn mower may not be ideal. Additionally, your yard size matters. Look for a small yard mower for less than about 1/4 to 1/2 acre of lawn. Clipping Options: We recommend getting a mower that at least allows you to bag or mulch your clippings. Many people do both or at least like to have the option for use during some time in the future. Self-Propelled: A push mower is not practical for sizable hilly yards because of the effort it takes to push the mower up the sloped areas. A self-propelled mower walk-behind mower or a riding mower is a better option. Mowing Height Adjustments: Many people mow their lawn at various heights depending on the time of year. A mower should have ample height settings to be adjusted as the user sees fit. Below are some tips for you to consider when mowing hills. If a hill is too steep for mowing, don’t risk injury trying to mow the area. Have a professional mow it who is skilled at maintaining sloped terrain. As an alternative, you can consider other uses for the land other than grass such as a mulched area. Get in the habit of examining the terrain before mowing to look for objects (kids’ toys, branches, etc.) that may be in the path of the mower. You don’t want to potentially swerve to avoid an object and tip over the mower by accident. Check the slope of the hill you plan on mowing and verify with the manufacturer that the mower is able to handle this type of slope. There are apps available for mobile phones that will provide angle measurements, which make it super easy to calculate lawn angles. Mow when the grass and soil are dry. Wet conditions can cause the mower or user to slip. 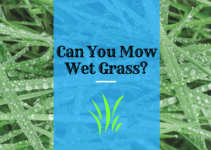 Additionally, wet grass can cause the clippings to clump. You want to avoid clogged blades or having to cut a hill twice because of these wet clippings. If you have the option, a walk-behind mower is often considered the best mower for hills in terms of control. You can image the comfort difference there is on a step hill between a huge riding mower weighing several hundred pounds, compared to a walk-behind that weighs around 100 pounds. Raise the mower cutting height to prevent scalping the lawn. Move slow and be consistent on slopes. Maintain a straight path unless there is an obstacle in the way. Avoid sudden speed accelerations or quick turns. Always remain focused no matter how many times you have mowed a hill. Be sure you are completely familiar with your mower before mowing slopes. Practice with your new mower on flat terrain before taking on uneven or hilly sections of your yard. Just having one of the best mowers for hills is not enough. You should master the operation of the machine before moving on to challenging mowing. 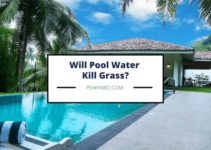 Will Pool Water Kill Grass? 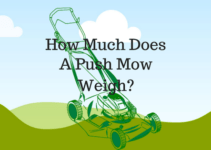 How Much Does a Push Mower Weigh?